Whether from overspending on avocado toast or starring in its own museum, the avocado has gotten a lot of press lately. But as popular as the luscious fleshy fruit may be, it has a dark side. It could send you to the emergency room. 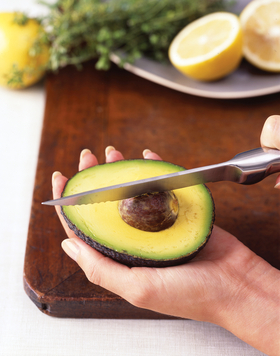 The danger of #AvocadoHand is spreading on social media, where users post photos and stories of accidentally stabbing themselves in the hand while trying to cut an avocado. And it's not just an epidemic on Twitter; the British Association of Plastic, Reconstructive and Aesthetic Surgeons last year called for safety-warning labels on the perilous pieces of produce. The avocado hazard has claimed some high-profile victims. Joy Behar, host of “The View,” ended up in the hospital overnight to fight an infection she contracted after an Avocado Hand incident. Acting queen Meryl Streep required hand surgery after her run-in with the treacherous pitted fruit.